Sensitive and touchy, the ZVex Woolly Mammoth bass fuzz effect pedal has a tremendous bottom end and a beautiful harmonic structure that sounds just as blistering with a guitar. The Woolly Mammoth's harmonic structure can be radically altered using the Pinch knob, adjusting the pulse width of the waveform. In the leftmost position, the waveshape is quite symmetrical, producing a smooth, creamy sound. Turning it up slightly introduces lovely intermodulation distortion. Turning it clockwise narrows the waveshape into asymmetrical pulses, making the tone reedier and brassier. This setting also introduces an unusually smooth gating action, giving you an absolutely eerie silence between notes. The pedal's "Wool" knob adjusts the amount of "fur" around the note. The EQ knob tilts the spectral response; turning it to the left adds lows and softens the highs. Turning to the right adds highs, then mids, and finally reduces lows. the Output knob Is designed for smooth, repeatable level settings. 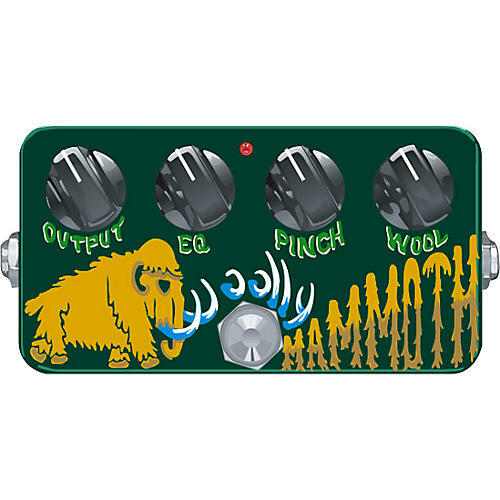 Additionally, the Woolly Mammoth's circuit draws less than 1/2 of a milliampere, far less than many other bass effect pedals on the market, thus dramatically extending battery life. The Mammoth also includes a 9V DC power jack and red On/Off LED.